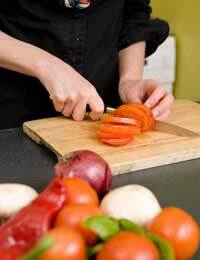 Home > Food Pyramid Hints and Tips > What Kind of Cook Are You? Answer the questions below and find out what your cooking style says about you. A – buy it on impulse. It looks like fun and you can always research it on the internet later – who knows, it could be the best thing since sliced bread? C – recognise it immediately. You’ve seen it before on a gourmet TV programme or in an upscale restaurant. You already know how to cook and eat it. A – A huge fruit salad with lots of tropical fruits, steeped in champagne. Easy to make and giving you plenty of time to sort out your outfit so you look stunning. B – Sticky Toffee Pudding. It’s something that everybody likes and it really can’t go wrong – also, it’s easy to transport. C – a tower of choux buns filled with whipped cream and with a caramel sauce poured over the top. It’s important that it looks good as well as tasting good. A – Ring up and order a take-away meal. Pizza or Chinese food are fine, once in a while and you really need to save your strength for work. B – Cook some sausages and mash with frozen peas. It’s traditional, simple, filling and comforting – and anyway, it’s important to make sure you have some solid food inside you when you’re under stress. C – Get out your cookbook and scour your cupboard shelves. There’s nothing as relaxing as trying out a new recipe and surprising your family with a beautifully laid dinner table. Keeping up standards is important, especially if you’re tired and miserable. Question 4What’s Your Ideal Meal? C – You don’t have one, it’s always whatever you saw on Masterchef this week. Total your answers and see whether you are mainly A, B or C.
Mostly A – you’re an adventurous improviser – to make the most of your natural inclinations, focus on cooking stir fries and making picnics and other outdoor treats as the speed of cooking stir fries will appeal to you, and al fresco dining meets your sense of occasion. Lots of fruit and vegetables in salads and oriental dishes will help you boost your nutrition intake. Mostly B – you’re a traditional cook – you don’t like to deviate too much from what you know you do well and you’re always happy with a cookbook to work from. To make the most of your strengths, buy a good recipe book based on the food pyramid or other healthy eating guidelines and use it to improve your diet. Mostly C – you’re a luxury lover and enjoy fine dining and beautifully presented food. To develop your best cooking instincts, learn to make sushi and other beautiful but healthy food options such as layered salads.